and no certainty of where it will stop. let the rhythm of the rails take hold. and think: oh, the places you’ll go! an expansive neither here nor there. but let go and sit back. here in the liminal space. I wrote the above as a result of my train ride from Seattle to Portland yesterday. It’s not even what I’d consider a finished poem (and I don’t write poetry often), but I share as part of my process. I’ve taken that route many times before, and I know: whether rain, shine, fog, or in that case, snow, there is never a shortage of beautiful views from the tracks. The above photo is of the south end of the Puget Sound. 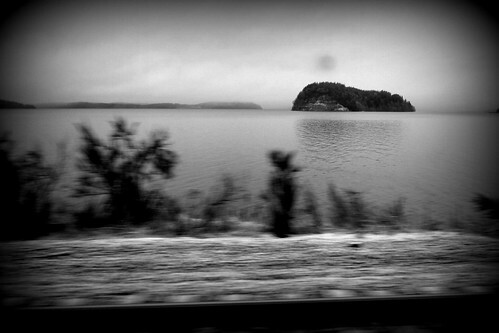 From the train I watched the snow fall into the Sound. It struck me odd that it is mid-March, and snowing in a region where little snow falls, and yet I’m told on that very day it was above 70 degrees in South Dakota. Sometimes, things don’t turn out as we expect. It’s mid-March and the mild winter has some things topsy-turvy. It is mid-March and I am not in Indonesia as I once expected. I use the words “liminal space” to describe where I am. It is a place at the threshold, between two worlds. Soon, I hope I will cross over the threshold (via the Pacific Ocean and the International Date Line) into a new life.